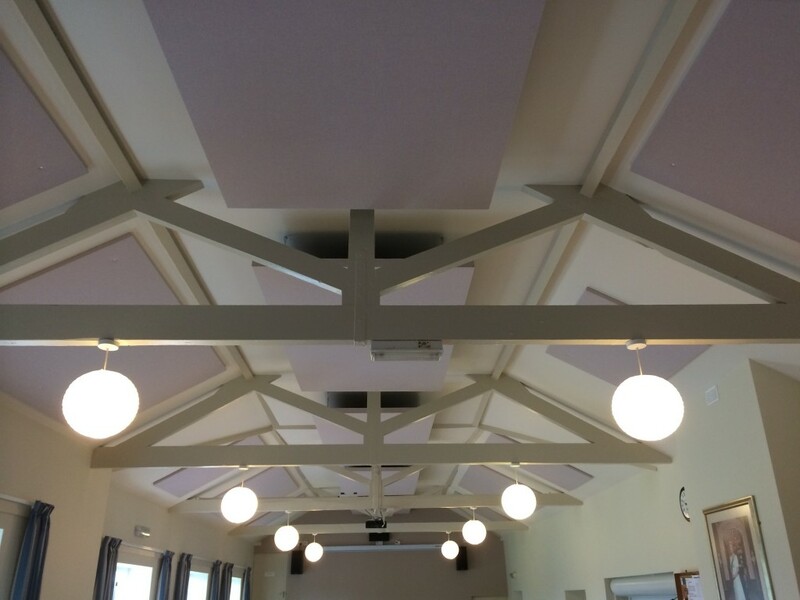 In late May 2014, Amadeus were commissioned to install acoustic treatment within Sandon Village Hall, Essex. The treatment in question was absorption panels hung from the ceiling. In the recent past, members of the Sandon Hall management committee decided to seek financial assistance in the form of a grant in order to improve this popular meeting place for the local community. 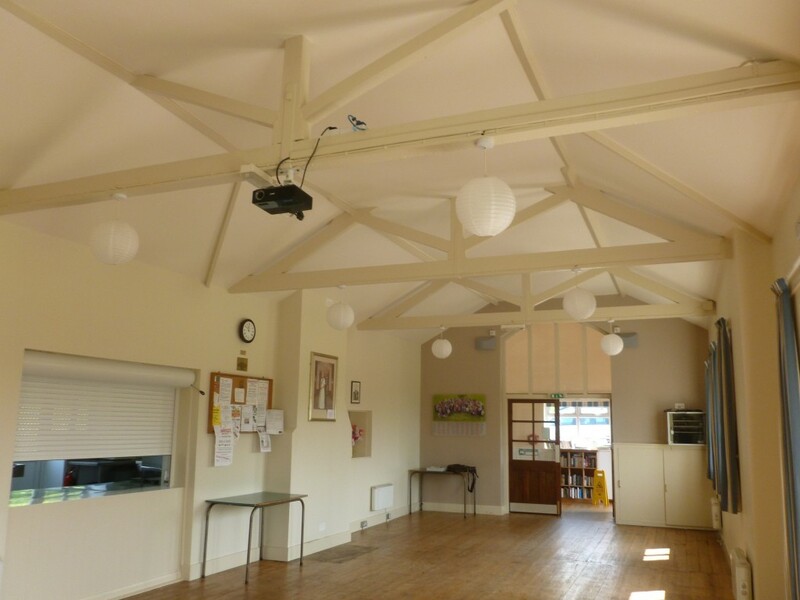 They met with success and so started the process of improving the look of, as they would say “our typical Village Hall”. An extension incorporating a meeting and gathering area, a place to leave apparel in safety; upgraded loos and kitchen, new windows, and several licks of paint. A little later, realising that a reduction in heating bills might be sensible another investment was made which saw the building properly insulated. The overwhelming view at the end of the work – “excellent place, nice to visit, fresh and clean and modern”. There was some continued disquiet about the noise made by various groups and events, not because they were boisterous, but because the room had no “softness”, nothing to “absorb” sounds. The sounds made by children, by music, by speech………..
First contacted by the Chair of the management committee in October 2013 for some idea of how to fix the problem. Photos followed showing the village hall in order to give a clue as to what was causing the problem and where and what type of treatment could be applied to improve the noise management within; an indicative budget was presented and additional fund raising could begin. A visit was made on May 1st to measure sections and determine the type of acoustic panel, it’s composition, its thickness its size and their location. Confirmation was sent a couple of days later, and soon after an order placed. It will be seen from the photo’s the treatment was carried out on the ceiling and higher angled walls. 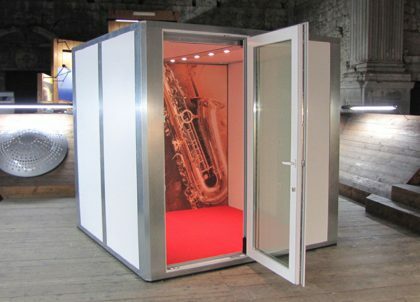 We used 25mm ABSORBOR ™, fabric covered acoustic panels. Those on the ceiling are suspended on chains and can easily be removed for either cleaning or decorating in the years to come. Those on the walls are secured using Cup & Screw. The reverberation in the space before treatment was over 2 seconds, it is now under 1 second. We are happy to put anyone interested in touch with a member of the committee for verification and to arrange a visit if interested. Many thanks to Sandon Village Hall for featuring in our Case Study. Images provided by Sandon Village Hall.